Start off your visit on the 11th (Sun): examine the collection at State Hermitage Museum and Winter Palace. Get ready for a full day of sightseeing on the 12th (Mon): contemplate the long history of Palace Square (Dvortsovaya Ploshchad) and then see the interesting displays at St. Isaac's Cathedral State Museum-Memorial. For traveler tips, where to stay, reviews, and tourist information, read St. Petersburg itinerary builder. Use the Route module to find suitable travel options from Singapore, Singapore to St. Petersburg. The time zone changes from Singapore Time (SGT) to Moscow Standard Time (MSK), which is usually a -5 hour difference. Traveling from Singapore in September, expect St. Petersburg to be colder, temps between 19°C and 9°C. Wrap up your sightseeing by early afternoon on the 12th (Mon) to allow enough time to travel to Kazan. You've now added Bauman Street (Kazansky Arbat) to your itinerary. Kick off your visit on the 13th (Tue): take in the architecture and atmosphere at Annunciation Cathedral, take in the spiritual surroundings of Kul Sharif Mosque, don't miss a visit to Kazan Virgin Monastery, then admire the landmark architecture of Saints Peter and Paul Cathedral, and finally get to know the fascinating history of Bauman Street (Kazansky Arbat). On the 14th (Wed), you'll have a packed day of sightseeing: pause for some photo ops at Mussa Jalil Statue and then make a trip to Raifa Monastery. To see traveler tips, ratings, reviews, and tourist information, read our Kazan travel planner. You can do a combination of train, bus, flight, and subway from St. Petersburg to Kazan in 6.5 hours. Other options are to drive; or take a train. 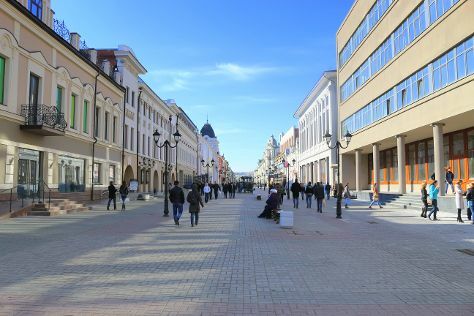 In September, daily temperatures in Kazan can reach 19°C, while at night they dip to 9°C. 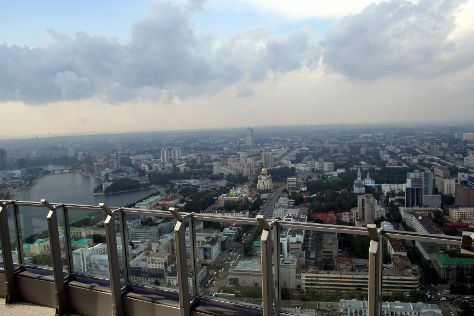 Wrap up your sightseeing by early afternoon on the 14th (Wed) to allow enough time to travel to Yekaterinburg. Start off your visit on the 15th (Thu): contemplate the waterfront views at Weir on river Iset, get great views at Visotsky Business Center Lookout, then contemplate in the serene atmosphere at The Church of Ascension, and finally take in nature's colorful creations at Kharitonovskiy Garden. Here are some ideas for day two: make a trip to House of Trade Unions-Sevastyanov Estate. For photos, other places to visit, traveler tips, and more tourist information, go to the Yekaterinburg vacation planner. Getting from Kazan to Yekaterinburg by combination of subway, train, flight, and bus takes about 6.5 hours. Other options: drive; or do a combination of taxi and bus. The time zone difference moving from Moscow Standard Time (MSK) to Yekaterinburg Time (YEKT) is 2 hours. Plan for a bit cooler nights when traveling from Kazan in September since evenings lows in Yekaterinburg dip to 5°C. On the 16th (Fri), wrap the sightseeing up by early afternoon so you can fly to Irkutsk. The most popular stop on the Trans-Siberian railway, Irkutsk gained fame as the cultural center of Decembrist exiles. Change things up with these side-trips from Irkutsk: Listvyanka (Stone Cherskogo, Baikal Limnological Museum, & more). The adventure continues: explore the activities along Lake Baikal, admire the natural beauty at Volkonskikh Park, pause for some photo ops at Monument to Admiral Alexander Kolchak, and stroll through Kirov's Park. For more things to do, reviews, maps, and more tourist information, use the Irkutsk travel itinerary planner. Traveling by flight from Yekaterinburg to Irkutsk takes 7.5 hours. Alternatively, you can take a train; or drive. The time zone changes from Yekaterinburg Time to Irkutsk Time, which is usually a 3 hour difference. In September, plan for daily highs up to 18°C, and evening lows to 3°C. Cap off your sightseeing on the 21st (Wed) early enough to travel to Ulan-Ude. Go for a jaunt from Ulan-Ude to Ivolginsk to see Ivolginsk Datsan (Buddhist Monastery) about 40 minutes away. Next up on the itinerary: don't miss a visit to Datsan Rinpoche Bagsha, pause for some serene contemplation at Holy Odigitrievsky Cathedral, examine the collection at Ethnographic Museum of the People of Transbaikalia Culture Gau, and pause for some photo ops at Monument to Lenin. To find maps, ratings, where to stay, and more tourist information, go to the Ulan-Ude itinerary planner. Use the Route module to find suitable travel options from Irkutsk to Ulan-Ude. In September in Ulan-Ude, expect temperatures between 19°C during the day and 3°C at night. Wrap up your sightseeing on the 24th (Sat) to allow time to travel back home.